With infrastructures around the world developing, heavy industries are becoming more important. Motors are getting bigger and the need for higher power output is growing in a wide range of driven equipment. Medium-voltage (MV) AC drives are needed to satisfy needs for variable speed AC drives in the medium- and high-power range. The higher voltage enables lower current, fewer losses and reduced system costs (related to transformers and cable sizes). 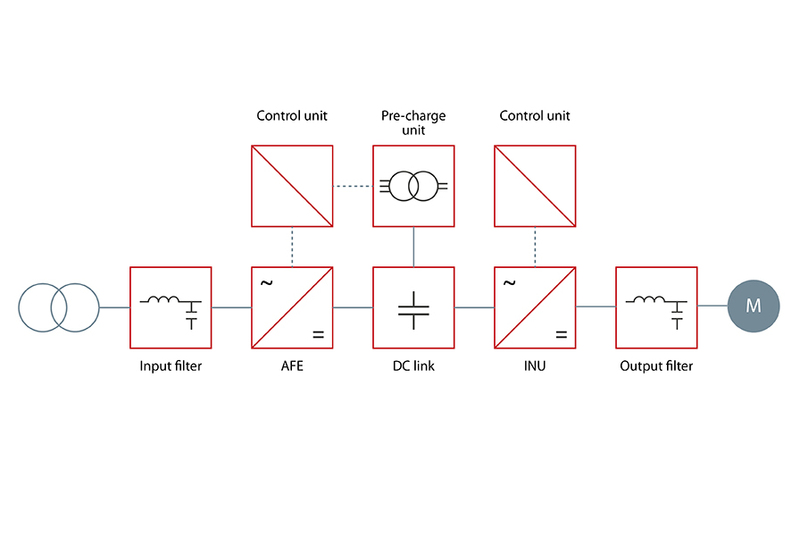 Many applications operate on an MV power supply. The most common being the pumps and fans utilized in marine and offshore, mining, metals, and oil and gas industries as well as marine propulsion. Operating in adverse environmental conditions, including dust, humidity and aggressive gases, they regularly push AC drives to their limits. Currently, the MV drives available are fixed-height, cabinet-built solutions. In applications where the AC drive is installed in a clean, standard electrical room, these can be sufficient. However, applications often need to be installed in an existing area where space is at a premium. A ‘one size fits all’ MV-drive solution can lead to compromises in the system design. 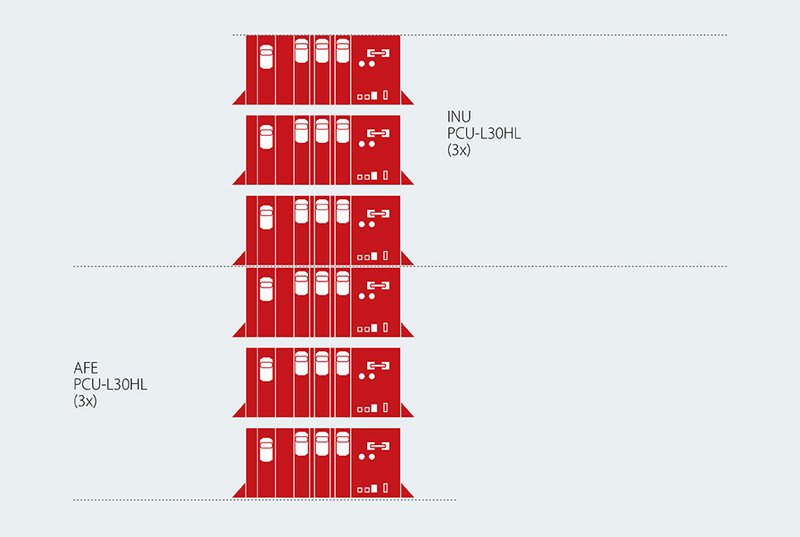 For example, in marine applications, space on board a vessel is very restricted. In order to incorporate a standard MV drive, the designer is obliged to compromise by taking space from other components on board. In the mining industry, space restrictions take many forms, from the limits placed on underground equipment to the high compactness of mobile machinery at the surface. For both underground and surface equipment, there is a need for flexible and compact MV drive configurations, which enable designers to flexibly integrate an MV drive into mobile equipment. The VACON® 3000 Drive Kit is a modular MV drive that offers a new dimension of application engineering for industrial applications with motor voltages of 3300 or 4160 V. It enables the complete customization of the enclosure to meet the unique needs, restrictions and characteristics of a variety of applications, including those with limited space and in harsh conditions. The VACON® 3000 Drive Kit is available in a power range between 2 and 6 MW. Basic configurations have a power of 2 or 3 MW. These configurations can be paralleled for systems of 4 MW and above. -It includes only the components you need and offers maximum design flexibility. -It is delivered as a set of separate modules, like building blocks. You create the MV drive by building the modules into your own cabinet. -It is compact, easy to integrate, and has high power density. -It is rugged and especially designed for harsh environments. -It is easily serviced, due to the easy replacement of phase modules. The VACON® 3000 Drive Kit offers comprehensive functionality in a single package. The kit can be selected with either a diode front-end (DFE)-based 12-pulse configuration, or an active front end (AFE) for regenerative braking and low harmonics. Kits can be configured to include input filters, an output filter, a brake chopper and other options to achieve desired characteristics under various operating conditions. 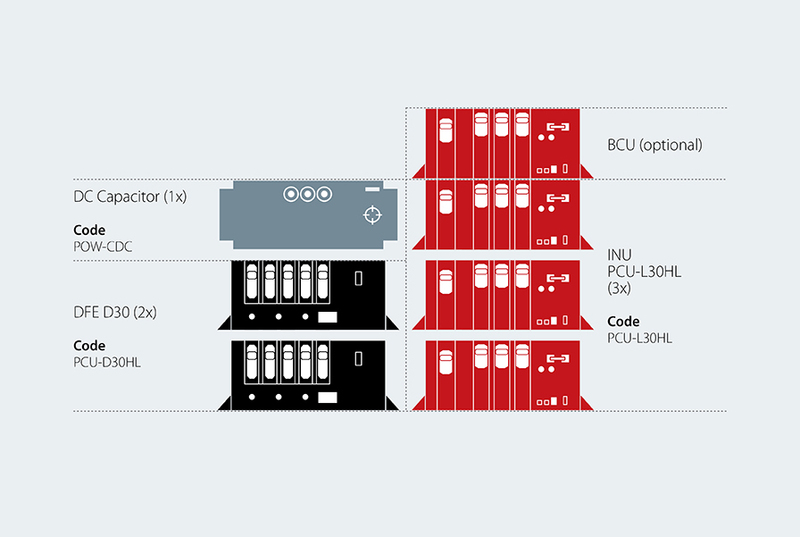 A modular MV drive is made up of units designed to fit together like building blocks. You can arrange them as required, in different horizontal or vertical combinations. This modularity means that you have the freedom to create the ideal configuration for each installation and purpose build a cabinet to meet any space limitation or comply with the ingress protection class demanded by the application. -Three 2 or 3 MW single-phase phase modules are installed to create an INU or AFE. -The same phase modules are used for INU, AFE and brake chopper units (BCU), which reduces the size of the spare parts inventory and offers higher reliability and greater accessibility. -The same physical size of the single-phase phase module, DFE module and DC capacitor for DFE, enables installing the modules in stacks and side-by-side. The VACON® 3000 is a rugged and reliable MV drive solution. It can manage high vibration and ambient operating temperatures between 0 to +45 °C, dependent on cabinet design. 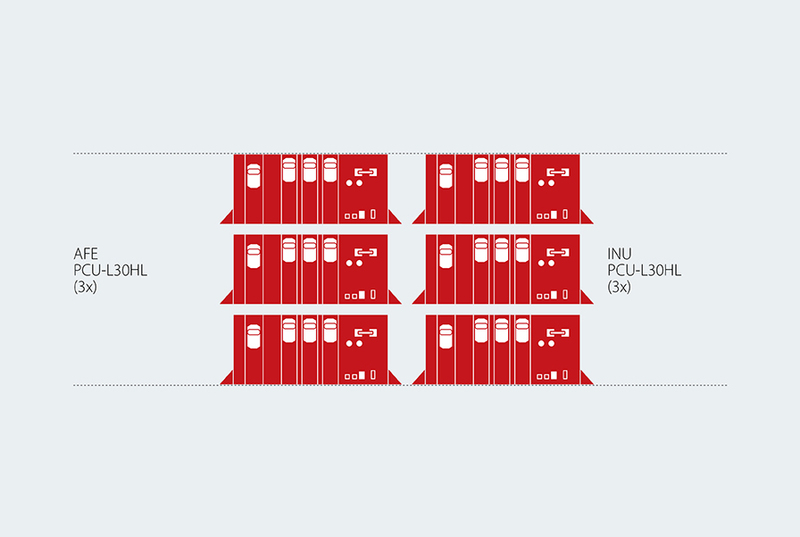 -The single-phase phase modules have a 3-Level NPC topology, which reduces the number of components in the AFE and INU sections, increasing the robustness and reliability of the product. -The IGBTs and other components inside the phase module are tightly packaged and are free of moving parts to ensure long life. -The modules are designed to be as maintenance free as possible. The DC link has film capacitors and there are no snubber capacitors in the modules. -Insulation material can cause problems and limit reliability. In VACON® 3000, the insulation is built into the structure of the phase module. -Liquid-cooled modular units ensure proper cooling without needing maintenance-intensive fans inside the modules. Good heat management through liquid cooling also lowers the total number of fans in the cabinet, reducing the overall maintenance task. No air circulation inside the phase modules for cooling also limits the ingress of foreign bodies such as dust from the external environment and protects the electronics. -The INU and AFE phase modules monitor the phase current and DC voltages, and in case of a fault, stop automatically and independently. The phase modules also have an earth fault detection circuit. The new modular VACON® 3000 Drive Kit enables the complete customization of enclosures to meet the unique needs, restrictions and characteristics of a variety of applications. The flexibility of the modular MV drive provides the opportunity to design and introduce AC drives to MV applications where it was previously impossible due to space restrictions. The power density of the liquid-cooled VACON® 3000 phase modules is twice as high as the MV drives currently available in the market. Rugged and reliable, the modules are easy to install, use and service. For more information, visit our website and find out more about our Medium Voltage Partner Program here. 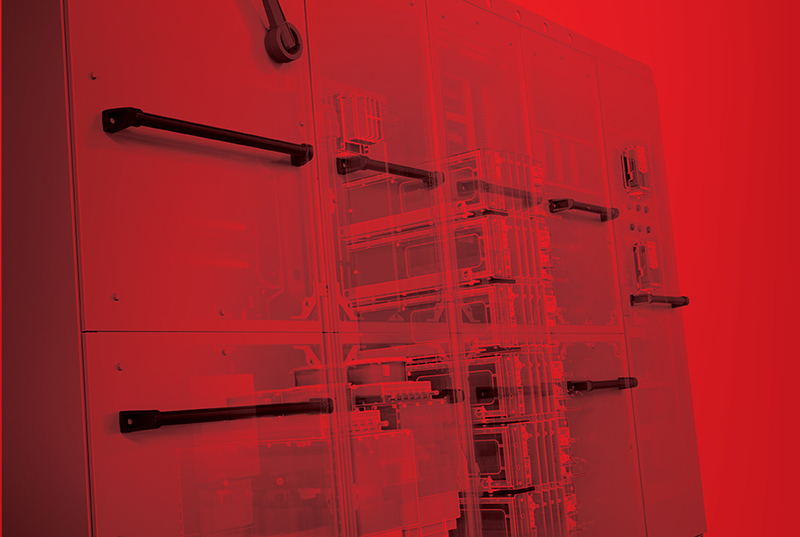 Or you can listen in to our webinar to learn about the new opportunities that modular medium-voltage drives provide. VLT® Motion Control Tool MCT 10… did you know? Customers feel the need – the need for speed!